Venous ablation is available at Encompass HealthCare and Wound Medicine in West Bloomfield, Michigan in our outpatient office so that you don’t have to go to the hospital. Our outpatient facility, located on the border of West Bloomfield, Walled Lake and Commerce township, is just minutes from many Michigan Oakland County cities. We also serve Macomb and Wayne counties. Venous ablation is a minimally invasive procedure of shutting down poorly performing veins in the leg so the body will return venous blood more efficiently through its healthier leg veins. This procedure is remarkably effective in permanently treating venous insufficiency so that leg ulcers can heal. This procedure is considered after other more conservative measures have failed, namely decongestive therapies like manual lymphatic drainage, unna boots, pneumatic compression pumps, and multi-layer compression wraps. This procedure is remarkably effective in permanently treating venous insufficiency so that leg ulcers can heal. Symptoms of venous insufficiency include leg pain or aching, skin itching, rash, and a feeling of heaviness which is worse after standing. This can progress to significant edema or swelling in the legs along with chronic and progressive color changes in the skin. Red color changes progressing to permanent brown or dark discoloration hallmark late stage venous insufficiency. 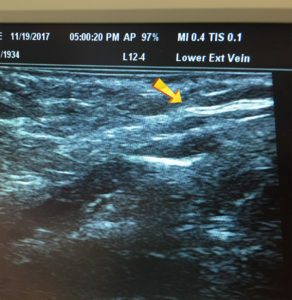 While venous ablation can reverse this underlying condition, often the skin discoloration changes are permanent despite resolving the symptoms or healing the venous stasis ulcer. At Encompass HealthCare and Wound Medicine, we use Ultrasound guided ClariVein, a non-thermal venous ablation system. This method represents significant advances in medicine, as it is far less invasive with fewer complications and dramatically improved healing rates when compared to outdated procedures like vein stripping or surgical vein removal. Venous ablation is one answer to venous insufficiency when conservative decongestive therapies are ineffective. Venous insufficiency is when your veins aren’t “sufficient” enough to return blood back to your heart normally and instead blood “pools” into your legs, causing pain, bulging veins, and a non-healing venous stasis ulcer. Venous insufficiency is a progressive illness that can swelling and lymphedema in the lower extremities. Left untreated, venous ulcers can form on the skin that require intensive wound management in order to heal. For more information on venous insufficiency, click HERE. ClariVein® is the latest endovascular technique for treating venous insufficiency. Since it is ultrasound-guided, Dr. Ruben know exactly where the needle is placed, allowing for precise accuracy. Venous ablation is inserting a rotating tube (catheter) into the vein, together with a drug, to close and seal it. Nothing but a local anesthetic is needed to perform the procedure. Patients are released to go home with only an unna boot.